On 2014, the Dutch railways (NS) ordered 19 new Traxx MS locomotives with DE/AT/BE/NL-package and a top speed of 160 kph. These machines are most important to the NS, as they will be at the basis for the Fyra V250 replacement time table, as presented earlier this year. 2017-01-07 [NL] NS E 186 011: fixed! [NL] NS E 186 011: fixed! As seen this morning by Hans van Kuilenburg in Amsterdam. Spare part in white? At this moment, the Dutch railways is using their E186 TRAXX locomotives exclusively for shuttle services on the lines Amsterdam - Rotterdam (- Breda). In April the machines will start to run on the route The Hague - Rotterdam - Breda -- Tilburg - Eindhoven. Between Rotterdam and Breda the high speed line will be used. For these service new 9-car compositions of ICRm coaches are being formed (designated ICRmh9), with which testing has begun. From Kassel to Bad Bentheim today: NS E 186 041 and 042. Thank you Christian Klotz, Markus Tepper and Marcus Alf. Strangely enough, the 042 has check digits (-5) on its fronts. The sticker guy made a mistake here? Markus Tepper, Roel Hemkes and Christian Klotz caught the new NS E 186 039 with their lenses this weekend. Today it will be delivered to the Dutch railways (NS). Spoorpro reports: As of Monday, all IntercityDirect services of the Dutch railways (NS) are being operated in sandwich mode; Every consist now has six ICRm coaches and two TRAXX MS (serie E 186) locomotives, one on each side. Currently there are two IntercityDirect services: Amsterdam - Schiphol - Rotterdam - Breda and Amsterdam - Schiphol - Rotterdam. These trains are underperforming due to operational problems and constant issues with infrastructure and rolling stock. Operating the IntercityDirect in sandwich mode is NS' answer to these issues, adding redundancy to the system and making it easier to change running direction. Over sixty TRAXX locos have been ordered and hired to have sufficient motive power, of which the majority is now available. NS also wants to operate the loco-hauled trains from Amsterdam to Brussels and its future Eindhoven - The Hague (via HSL) IntercityDirect trains in sandwich. 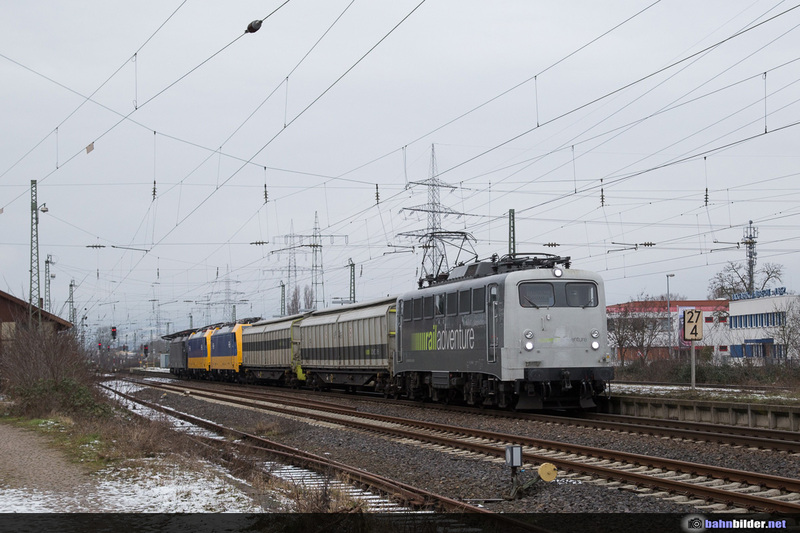 The first image shows RailAdventure on its way to bring NS E 186 033 and 036 to Bad Bentheim. On 05.09.2016 both engines arrived in the Netherlands and ran to Amsterdam. Of the second bacth of 18 locomotives ordered (E 186 020-037) two more have to come: no. 035 and 037. Thank you Markus Tepper / Rene Klink / Roel Hemkes. When the delivery of batch two is completed, 8 more E 186s will come. Mr. Klotz was able to catch the new NS E 186 033 and 036 yesterday/today. On 27.08.2016, NS TRAXX E 186 034 arrived at Bad Bentheim. It is the next machine to be handed over to the Dutch railways. Akiem > HSL Logistik was awaiting its next freight train at Bad Bentheim, which resulted in this colorful meeting. The 034 is delivered before 186 033 that had its maiden run on 26.08.2016 (see picture below). Our thanks goes out to Christian Klotz and Henk Zwoferink. On 23.08.2016, Martin Voigt was able to capture the new NS E 186 034 during its maiden run. The locomotive was seen in Fulda. Since today in the Netherlands: NS E 186 031. Thanks to Roel Hemkes. Today, the next two new TRAXX MS locomotives for the Dutch railways arrived in The Netherlands. E 186 029 and 030 went to Amsterdam today and will be completing their 1.000 km approval run during the next days. Thank you Roel Hemkes and Niels Arnold. 19.07.2016: Maiden run of NS E 186 028 (Marcus Alf). On 21.07.2016 NS E 186 029 had its turn (Christian Klotz). 2016-07-16 [DE] NS E 186 026 and 027 on their way..
[DE] NS E 186 026 and 027 on their way.. This weekend, NS E 186 025 was transported by RailAdventure 139 558, from Kassel to Bad Bentheim. It was done with an impressive transport, as the locomotive was coupled onto a convoy with an ICx/ICE4 train and five EuroExpress coaches. A long long trains. Thanks Jake Langerak, Martin Lauth and René Klink. The second one this week. On 05.07.2016, the E 186 025 completed its maiden run, this morning the E 186 026 was next. Thanks Christian. Seen this morning in Kassel: the future NS E 186 025, thank you Christian. Not one but two. This weekend Bombardier delivers two TRAXX MS locomotives. Edit: Today they were taken to  Amersfoort by Beacon Rail 561-03. Thank you Christian Klotz, Markus Tepper and René Klink for the images. Yep, not in a logical order, but indeed, on Monday the Dutch railways will pick-up E 186 020 in Bad Bentheim. Thanks René Klink. NS TRAXX MS E 186 022 arrived in the Netherlands today. Thanks Roel. Yes, the delivery of the new NS TRAXX locomotives does have a small hick-up for our number fans. It started with E 186 021, which arrived in the Netherlands yesterday (image below). Next one to come is E 186 022, which had its maiden run this morning. We expect E 186 020 to be the third unit to arrive. Not 18, but 26 supplemental TRAXX MS locomotives will be delivered to the Dutch railways (NS). This means NS will soon own 45 multi system electrics for its passenger services. The operator wants to operate all its trains for which it is using ICRm PRIO stock in sandwich formation (one loco on every end of the train). At this moment this is already done with the IC Direct shuttles Amsterdam - Rotterdam via the high speed line between both cities. Note that the route of the IC to Brussels will change compared to the current service. The train will no longer halt in The Hague, Dordrecht or Roosendaal, as the 'new' IC to Brussel will use the high speed line as much as possible. Delivery of a second batch started this week with unit no. 186 021. In the next weeks 186 022 and 020 will come to the Netherlands. NS already owns 19 machines of this type (186 001-019). When delivery is completed, NS will own 45 186 series locomotives. NS will also continue the lease of 12 identically configured TRAXX MS locomotives from Alpha Trains: 186 111-122. These machines have all recently been subjected to a R1 overhaul in Dessau (DE) including a repaint in NS blue and yellow. NS is also still hiring TRAXX MS locomotives from Macquarie Rail, being 186 142, 144, 148, 149, 236, 237, 238 and 239. Of these machines, 186 148 is currently away to Dessau (DE) for a R1 overhaul. It is not clear if these will be returned as soon as more new locomotives are being delivered. The delivery of the second batch of TRAXX locomotives to the Dutch railways (NS) has started. First to arrive in the Netherlands is unit E 186 021, next Monday. The machine has already left the factory area, the picture showing it at Kassel Hauptbahnhof with a RailAdventure transport train and good old 139 558. Update: The damaged E 186 008 is sent back to Kassel. On 30.07.2015 the machine left the Netherlands. On the morning of 03.08.2015 the machine was first seen in Kassel. Several NS locomotives are on the move. Back from Hennigsdorf are NS E 186 016 and 017, that arrived in the Netherlands on 02.08.2015. We also expect the overhauled Alpha Trains>NS E 186 117 and 122 soon back from Dessau. Railexperts vertrekt om 17:15 uit Bad-Bentheim met de Locon 9903 en de 186 016 en 017 in opzending. Rond 19:15 komt het transport aan op de Watergraafsmeer. Patrick thanks voor de foto! Veel succes! For the next years, this will be a common sight. Two Traxx MS locomotives top and tailing a rake of ICRm coaches. Amsterdam - Rotterdam (AmRo) will be done with such compositions. Currently tests on this route are being performed. Same for future Eindhoven - Den Haag trains. This is why NS recently ordered 18 extra locomotives. On 23.05.2015, NS E 186 016 and 017 came back to the Netherlands after serving as tast bed locomotives at Zurich for Bombardier. On 24.06.2015, they left the country again, bound to Germany. Let's see where this transport is going. A first image of the transport here. Dutch state rail operator Nederlandse Spoorwegen (NS) has decided to order 18 extra Traxx MS for its future passenger services over the HSL (high speed line). Things brings the total of E 186 series locomotives in the fleet of NS to 37. Nineteen are already delivered (E 186 001-019). Start of the delivery of this second batch is envisaged for May 2016. This second order comes from an option taken from the original contract NS closed with Bombardier in 2013. NS first wanted to explore the possibilities to use the new Traxx MS in combination with existing driving trailers (type ICRm BDs), but a pilot project (two coaches have been adjusted) has shown that rebuilding the coaches in order to make them communicate with the new locomotives is not feasible. So push-pull operation is a no-go. This means that NS will use its Traxx MS locomotives in sandwich-operation (one locomotive on each side of the train), thus needing many more machines. Sandwich operation is planned for the Amsterdam - Rotterdam shuttles and for the new services between Eindhoven and The Hague over the HSL. The new machines will also be needed for InterCity services to Brussels. The E 186 series of the Dutch railways (NS) is complete again. After the return of E 186 016 and 017 (that were used for tests by Bombardier in Zurich (CH)) now also E 186 018 is back in the Netherlands. Last night the machine came back from Wegberg-Wildenrath, towed by Locon 9904. An exotic transport: RailAdventure transporting various locomotives and coaches up north. Behind the 139 558 one sees the NS Traxx MS locomotives 186 016 and 017 that come from Zurich, were Bombardier used them for tests with new Twindexx Swiss Express trains. Then there is the red Bombardier 187 009 that has been used by Swiss Rail Traffic replacing the SRT 487 001. The Vectron in this train is 193 901, also coming from Switzerland. 193 902 was left behind in the Alp country. The E 186 016 and 017 have been spotted in Emmerich already. In April, the Dutch railways (NS) wanted to the start the AmRo shuttle: a direct shuttle service connecting Amsterdam and Rotterdam. But, the introduction of these trains is delayed, as rolling stock envisaged for these services still needs some testing to do. NS is going to use revised ICRm coaches top and tailed by a Traxx MS locomotive (sandwich composition). Currently, we think 186 001-006 have the software installed to be used in sandwich mode, which means they are no longer available for normal services. 186 001 and 004 are testing with a rake of ICRm coaches in final composition. Routes and dates are rather random. 186 003 and 005 have been seen with the 'Testtrein' rake of coaches. These runs focus for example on bogie behavior. Today, the NS 1760, pulling the IC from Berlin to Amsterdam lost its heating power. A Traxx came to the rescue and took over from Deventer. A unscheduled first for the NS Traxx hauling this service. Today, the Dutch railways officially took delivery of the 19th and last locomotive of its new E 186 series. Within nine months after the order was published, Bombardier was able to sent the first machine to the Netherlands. From August 2014 to January 2015, all 19 units arrived in NL and many of them already have been used for revenue service. In the upcoming years, these new locomotives will be pulling the new domestic intercity services that will make use of the the high speed line infrastructure between Breda - Rotterdam and Rotterdam - Amsterdam. They will come to Eindhoven and The Hague. Most likely they will also serve as back-up for the Benelux services Amsterdam - Brussels. For this they still need to be granted approval for the Belgian rail network. Is it a coincidence? Yellow meets yellow. The first service of the brand new SRT 487 001. The NS E 186 016 and E 186 017 have arrived in Basel and will be taken to Bombardier's engineering offices in Zürich. The arrival of NS 186 018 was sooner as expected. We expected Monday, but the machine arrived in the Netherlands today. The transport of the locomotive was combined with other transfers. This resulted in a mixed train pulled by MRCE ES 64 F4-110 pulling 186 018, RailAdventure's 139 558 and a Desiro ML train for the Belgian railways. Next week, the last E 186 locomotive for the Dutch railways (NS) will be delivered. E 186 017 is its number. This means the serie E 186 001-017 is complete, leaving only the final two machines of the batch in Kassel. It is expected that the E 186 018 and 019 will arrive in NL early 2015. Meanwhile, Nedtrain, the company that currently adjusting two ICRm driving trailers for push pull operation with these yellow and blue Traxx MS locomotives, has released an image of the new interior of the driver cab. This is only a trial process. Push pull service of Traxx MS and ICRm is something that may become reality in the future when test are successful and costs are justifyable. E 186 001 and 002: These two machines are no longer available for the Amsterdam - Bred shuttle services. They got new software for testing sandwich traction. E 186 015: Was expected to be delivered last weekend, but the 016 was sent to the Netherlands in stead. The 015 required some extra work to meet the delivery requirments. It arrived at Bad Bentheim last night and will enter the Netherlands today, if not already happened. E 186 016: Arrived in Bad Bentheim on 06.12.2014 and arrived in the Netherlands two days later. On 19.11.2014 and 20.11.2014, a NS Traxx MS locomotive (unit no. E 186 003) was seen in Belgium multiple times, pulling an empty rake of NS ICRm coaches. Bombardier 35144 - NS E 186 010, REV 29.10.2014, has arrived. Yes, NS E 186 007 is in Belgium. It is hired by the NS to Bombardier. The manufacturer used the locomotive yesterday for ETCS tests, together with SNCB no. 2830. The latter locomotive was also seen on the Ducth BetuweRoute last week during trials. On 28.10.2014, test runs were made in the Netherlands, using two Macquarie Rail E 186 locomotives in 'sandwich' with six ICRm coaches. With this train the functioning of the machines in multiple mode was evaluated. Both locomotives could give traction, or only one. If the machine at the end of the train gave traction, it was operated from the leading machine. Both locomotives used, e.g. E 186 149 and 239, are part of the locomotive fleet of the Dutch railways (NS) for some time now, but are rarely seen. The test are being held for the Amsterdam - Breda shuttle service of NS. Yesterday, NS E 186 007 popped up in Antwerp. Remarkable because the Dutch railways have no official plans to use these new locomotives outside the Dutch rail network. A week before, NS E 186 003 took a rake of ICRm coaches and a 1700 locomotive from Maastricht to Lelystad for test about longitudinal forces on the train. A week later, NS E 186 006 took the convoy back to Maastricht. This morning, the 8th Traxx MS locomotive for the Dutch railways (NS) arrived in the Netherlands. E 186 008 will arrive at Amsterdam-Watergraafsmeer depot today. Meanwhile, E 186 001 and 002 are regularly seen in normal service between Amsterdam and Breda. Last weekend, E 186 003 made a trip to Maastricht, where the locomotive picked up NS 1748 and a rake of ICRm coaches. Today, one of Hollands biggest rail events ever started: Spoorparade. This is a 6-day event about railways from the past, the now and the future in the Netherlands. This year our country celebrates the 175th birthday of its railways. Part of the 'modern' parade is the new Traxx MS no. E 186 004. It gave us the opportunity to take a very close look. Remarkable are the many technical markings still being crossed out, and the immediate change of the NVR-number when such a locomotive arrives in NL. For the rest, it is very very yellow, and shiny. Of course, there was a lot more to see! Curious? Click here for all pictures of today. This morning, E 186 007 has arrived in the Netherlands. Meanwhile it should have arrived at Amsterdam-Watergrafsmeer depot. Curious is that all new NS E 186s get their NVR number changed after arrival from Germany. They are all delivered with NL-NS markings, that are quickly changed into NS-HSA. E 186 001 and 002 are meanwhile a regular sight in revenue service. They are often used to pull the Amtserdam - Breda Intercity Direct shuttle. Little surprise for us today, a test run with NS E 186 008 today around Kassel. Until now, we only saw unit no.001 from this series making a run under its own power. Per 10.09.2014, the first two Traxx MS locomotives recently delivered to the Dutch railways (NS) are available for regular services. E 186 001 and 002 are ready to go. Today, E 186 002 was used immediately for the Intercity Direct shuttle trains connecting Amsterdam with Breda. That looks like this. For the first time we see a NS Traxx locomotive coupled together with the ICRm coaches it will start its regular services with next December (Amsterdam - Rotterdam to start with). A train does include a ICRm driving trailer, although we do not expect these trains to start in push/pull operation. It takes more time to adjust the driving trailers than just a couple of months. Early this morning, E 186 001 left the Amsterdam-Watergraafsmeer workshops for its first trial runs. The locomotive runs with ICRm coaches, some of them in the standard yellow and blue IC-livery, others with the former Fyra-livery, that will disappear. There are also time tables available for the trials, for whom is interested. And we have an image of the first run in the Netherlands. Pjort Schraal sent us a picture made this morning, while the locomotive was travelling from Emmerich (DE) to Amsterdam-Watergraafsmeer (NL). In this picture, the locomotive passes through in Maartensdijk. Note the distinctive overhead portals. During the past week, we had several updates on the new Traxx MS locomotive for the Dutch railways. The locomotive is in Emmerich now and will continue its journey into the Netherlands tomorrow morning. Many comments were posted, when new images appeared on the net. All had different opinions on the livery of the new machine, both positive and negative, which is okay of course. Taste is totally objective. However, two things were mentioned over and over again: First there are the small NS logos, looking a bit 'lost' on such a large blue surface. Secondly, many people craved for a nice, short Dutch service number. It inspired us to make two alternative dessins. The first simply answering the two remarks stated before. The second one just a bit more 'out of the box', using the same trick as the Norwegian railways do with the El18 electrics right now: display the nice scenery of the country. What do you think? There it is! The yellow Traxx. This morning, locomotive E 186 001 started its maiden run from Kassel. It is the first of nineteen locomotives with a DE/AT/BE/NL-package and a top speed of 160 kph, that will be delivered to the Dutch railways (NS) in 2014 and 2015. These machines are most important to the NS, as they will be at the basis for the Fyra V250 replacement time table, as presented earlier this year. Our idea was very accurate. On 28.07.2014, the very first Traxx MS painted in the livery of the Dutch railways (NS) was seen outside the Bombardier factory in Kassel. The yellow machine, with blue side panels, represents the DE/AT/BE/NL configuration with a top speed of 160 kph. The locomotive has NVR number 91 84 1186 002-9 NL-NS. In 2014-2015 nineteen yellow and blue Traxx machines will be delivered by Bombardier from Kassel. They will be used for the Intercity Direct services, using the Dutch high speed line on certain routes. The first coaches are already adjusted (ICRm), waiting for things to come. This news item will follow the developments about the 19 new Traxx MS locomotives Bombardier is building for the Dutch railways (NS). With these new machines NS will set-up new passenger services partially using the conventional network and partially the High Speed Line (HSL-Zuid) between Breda and Rotterdam and Rotterdam and Schiphol/Amsterdam. These fill the gaps left behind, now the AnsaldoBreda trains ('V250') are given back to the manufacturer. The new trains will have the Intercity Direct brand name (Fyra belongs to the past). Like the normal NS intercity rolling stock, they will be yellow with blue window areas. So expect Traxx MS locomotives in yellow and blue. The Dutch Railways have decided to order 19 new Traxx MS locomotives (DE/AT/BE/NL configuration) for its passenger services that will include the high speed line (HSL-Zuid) in the Netherlands. Loco-hauled trains will be the short term alternative for the long planned domestic services that should have been running with the now troubled V250-trains from AnsaldoBreda. These are now topic of a dispute between NS and the Italian manufacturer. Delivery of the 19 new machines is planned for the end of 2014. They will be operated on the relations Amsterdam – Rotterdam (as of December 2014) and The Hague - Eindhoven (as of december 2015) via the HSL. The new name for these trains will be most likely Intercity Direct. This name replaces the Fyra brand next week. Their top speed will be 160 kph. The Traxx MS is already approved for both the Dutch conventional rail network and the HSL. Maintenance will be done at Watergraafsmeer workshop, near Amsterdam. There they have already plenty of experience with the type, as they are already maintaining the similar locomotives that are being leased from Alpha Trains and Macquarie Rail.